Stardate 4223.13: the sky's pitch black, the universe is even more ancient, the sidereal cold's famished. A shy glow on a bare thirsty spot of land tries to fight darkness. It's helped by its allies, the strange sounds coming from a dozen creatures. There's a bigger one, name's Santa Bernard, emitting lower notes. In front of him/her/it, the rest of 'em, kinda cooing [kinda], crouched down in a semicircle. Santa Bernard- Well jellies [pet name for alien 'kids' which are the human equivalent of a mix of a mutant squid, a bag of dirty socks and a fatter version of a crimson Shrek seriously addicted to napalm] this is the story of how the Cosmic Xmas Tree was finally decorated with its most precious ornament, the 'Ridiculously Low Albedo Ball'. 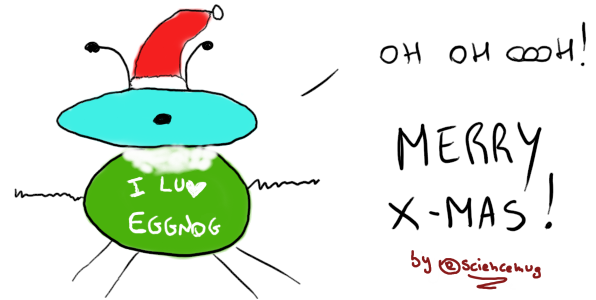 The jellies kinda make [kinda] a loud- Oooohhh... - and then- Santa Bernard? js- What does albedo mean? SB- Well, little bunch of atoms and quantum stuff, when light hits a celestial body, be it a planet, a comet or an Emily Ratajkowski, a fraction of that light's reflected by that body. The albedo is the ratio of the reflected light to the hitting (incident) light. The lower the albedo, the darker the celestial body. Gotcha? Bo- What's an Emily Ratajkowski? SB- It's both a hot celestial body of a distant galaxy and a universal measure unit for a 1 to 14 aH (Astral Hottness) scale, where 1ER means a Sacha Baron Cohen in a tiny tiny micro-bikini (and before you ask, the answer is: a nasty nasty thing) and 14ERs mean, well, Emily Ratajkowski. Ok? Can I start telling the story now? SB- Good, listen up then. Once upon a time, in a planet far far away, a baby spacecraft was born from its mama-NASA. The baby probe name was Kepler and Kepler at its birth weighed 1052.4 kilograms [yup, aliens are smart, hence they use the SI] and was about 2.7 meters in diameter and 4.7 meters high. Besides, thanks to its 10.2 square meters wide panels, Kepler could feed on what its grandad (the star of that system, Mr. Sol AKA the Sun) was giving it: a slice of the electromagnetic radiation cake. 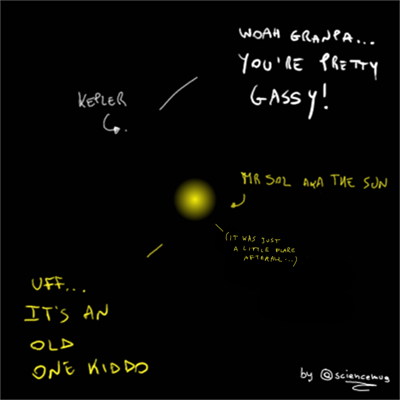 Kepler was a solitary kid-probe, indeed it left [March 6, 2009] grandma planet-Earth (with its mama-NASA's blessing) at its birth, and went to live around Mr. grandpa Sol. I mean, literally around the Sun: Kepler was loitering in a Sol-centered orbit and its year was 371 days long. One of the jellies kinda squeal [kinda]- Santa Bernard, wasn't Kelper scared to be all alone? - Kepler Charlotte, its name was Kepler - Santa Bernard answers the question with what can be considered an alien grin (or the manifestation of a slight stroke in association with a violent rash caused by an almost lethal exposition to a gamma ray burst and/or a "Lord of the Ring" marathon) on what can be considered an alien face (or a battlefield where nightmares of endless generations of seriously deranged werewolves fought a raging war against cholesterol and silver bullets budding from a parallel universe where they were garlic coated square donuts) - and no dear, our little spacecraft wasn't scared to be all alone out in the space, on the contrary, it was very happy like that. And I'll tell you why. 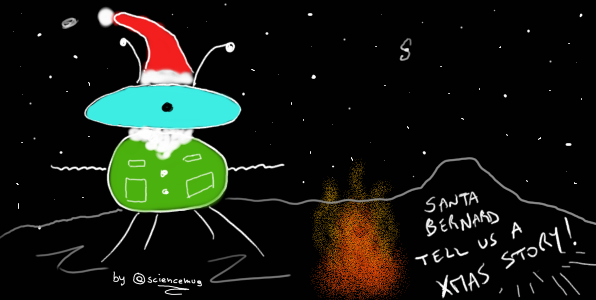 Since ever, Xmas had been the happiest part of the years for Kepler, of its own and of its grandma-Earth's. Therefore Kepler's deeper and most secret desire had always been to find the ultimate piece of ornament for the Cosmic Xmas Tree, the ultimate space Xmas ball. And Kepler needed to be alone, in a quiet place, to better concentrate for its mission. Because this mission was a very very, very difficult one, since our kid-probe had to face the competition of the other members of its extended family of human made space objects. There was his big brother, for a start, the beloved Hubble telescope (or was it a cousin, Kepler wasn't quite sure since Hubble had gotten space-DNA straight from both mama-NASA and aunt-ESA) which had collected the stunning lights for the CXT in the shapes of nebulae and galaxies since nineteen years before Kepler's birth. His bro Cassini-Huygens (or cousin, again, Kepler didn't know for sure since C-H got spacecraft-genes straight from mama-NASA, aunt-ESA and aunt-ASI) had spent ten years providing wonderful silvery rings and Saturn and Saturn's moons balls to the CXT. The dead sibling Galileo, may it rest in peace, had passed away six years before Kepler's birth, but only after a fourteen years long life during which it had decorated the CXT with amazing Jupiter reddish-orange balls and even provided fireworks made out of a comet crash onto the giant planet-ball. And, then, the other brother, spacecraft Messenger, that for more than a decade had been an authentic maker of Mercury balls. Another young sibling, Curiosity, in just two years had dug all the martian stylish red dust that was usually spread on the CXT to embellish it. Not to mention the heroic cousin, Rosetta (aunt-ESA's most famous daughter) and its son Philae: after a ten years trip and a three years hibernation/coma, they had just catched the SHOOTING STAR* to put on top of the Cosmic Xmas Tree! Ah, definitely, so many of them. And so so good at their jobs. And just think, these ones were only a fraction of Kepler's family. SB- Planets outside Kepler's grandpa's garden, the Solar System. Kepler searched for these extrasolar planets peeping the Cygnus-Lyra region, a piece of Kepler's grandma-Earth's northern sky stuffed with stars and therefore potential planets. And therefore potential perfect CXT's balls. Kepler couldn't help but staring at that spot of the universe, observing 100,000 stars at the same time, stars that were from few to thousands of light years far away. It did it constantly, restlessly, stubbornly, since its birth. And Kepler chose to live in a specific solitary orbit around Mr. Sol not only to easily concentrate, but also because it had so gained a clean view of its adored chunk of cosmos. In that orbit, in fact, nothing (neither Mr. Sol, nor grandmother Earth or great aunt Moon) could hinder Kepler observation. Not even for a microsecond. So- I don't get it, Santa B. You said Kepler was looking for planets, but you also said that it was observing stars... How could it find planets by staring at the stars? SB- Aaah, this is a very good question pal. Excellent! - Solomon kinda blush [kinda] - I'll let you hear the answer directly from a page of mother-NASA's diary: "[Kepler] simultaneously measures the variations in the brightness of more than 100,000 stars every 30 minutes, searching for the tiny "winks" in light output that happen when a planet passes in front of its star." Before you ask, Solomon and jellies, Kepler could perceive and quantify those tiny winks thanks to its only inner organ-instrument, the photometer (or light meter). But let's go back to mom-NASA's diary: "The effect [of the winks] lasts from about an hour to about half a day, depending on the planet’s orbit and the type of star [...] [and Kepler is born] to detect these [winks, these] changes in the brightness of a star when a planet crosses in front of it, or “transits the star.” This is called the “transit method” of finding planets". SB- Good, little loaves of hadrons. Now it's nap time. js- Noooooooo, we want to hear the rest of the story, please Santa Bernard!